We do have wait lists as the age levels fill up. A few teams have already moved off the wait list! We will continue to update this Down 'N Dirty Tournament page as we prepare for the warm June weekend. If you are looking for Assistance with a hotel or dining in Eagan, please contact Kathy O'Connell at the Eagan Convention & Visitors Bureau. Nationals Berth: First and Second place in Gold and Silver brackets earn an unpaid Nationals berth; Team choice for NAFA or MOA. Admission: NO admission fee for this tournament. Parking: There is no charge for parking. Please be respectful and park between the painted lines. ** PLEASE DO NOT PARK on sidewalks, grassy areas or near the "No Parking" signs. The City of Eagan will ticket and TOW violators. Apparel sales on-site. Souvenir t-shirts $20 each. Please check the schedules for updates before your first game. Brackets will be added once Pool Play is complete. NOTE: Some 14U & 16U teams will play Friday night 6/14. All others begin play on Saturday 6/15. Team Check In: All teams MUST turn in a signed copy of their official approved roster at least one hour prior to their first game. Rosters are printed from the JOSoftball website. Teams will not be able to play unless a printed roster form is turned in. It is YOUR responsibility to check for schedule changes. Thank you to all the Teams for participating in the 2018 Down ‘N Dirty Tournament. 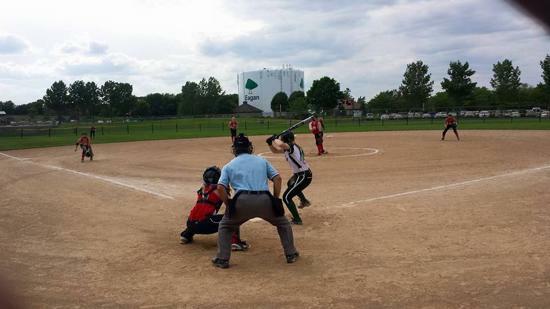 Eagan Fastpitch Softball will once again host the Youth 1st Team Awards Program in the 2018 Down ‘N Dirty tournament. It is a simple, yet significant program that will enhance the experience for players, coaches, umpires, and fans by placing an emphasis on good sportsmanship and positive conduct. REMEMBER…. It’s about the kids. I WILL …. Keep my competitive energy in check. I WILL ALWAYS …. Treat officials and opponents with respect. We are asking all coaches to please partner with your umpires to ensure that this emphasis is maintained throughout the game by yourself, assistant coaches, your players and your fans. We also recommend sharing the card with your fans as the game starts. At the conclusion of each game, the umpire will vote for each team that exhibits the conduct, behavior and attitudes as defined by the three points of emphasis. Remind your parents the team vote includes PLAYERS, COACHES AND FANS. After the tournament, teams that receive positive votes of 80% (or more), compared to the number of games played, will be contacted. 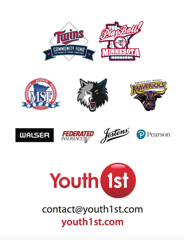 These teams will be recognized in their community with a Youth 1st Team Award, including MN Twins tickets and pre-game recognition at Target Field! Thank you for assisting us in this process. We believe the Youth 1st Team Awards Program is a positive influence during the tournament, making the experience even better for you, the fans, officials and especially the kids.